With the lush marshlands, extensive savannahs and open grasslands, Savuti in the Okavango Delta in Botswana is swarming with wildlife. 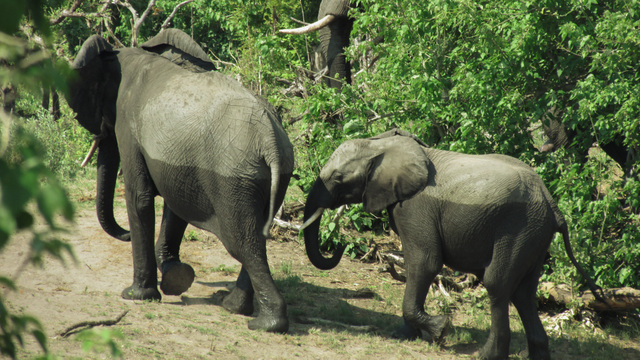 Go on a game drive at any time of day, even in the mid-day heat, and you are likely to see at least a few animals – and most definitely a few elephants. 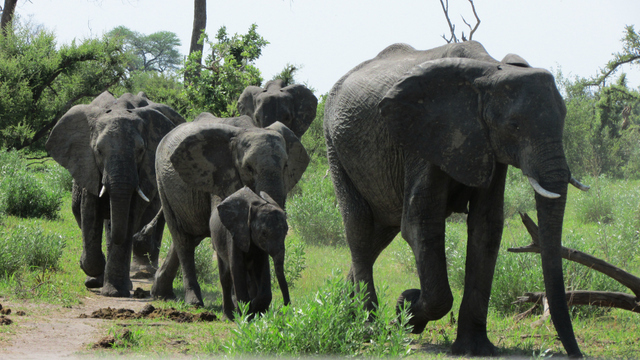 The area is home to a massive population of pachyderms, more than I have ever encountered in a game reserve before. Savuti is also one of the few places in Africa where lions have been known to take down elephants. 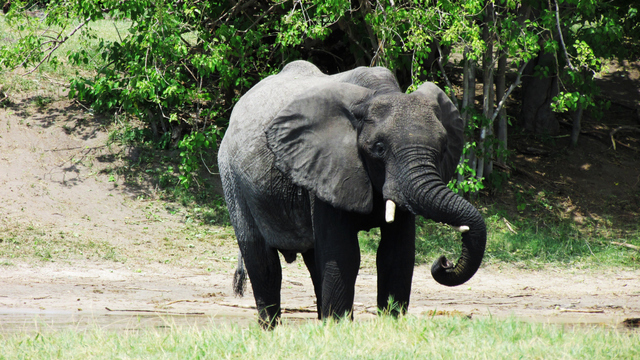 Here are a few photographs that show off the colossally elegant elephants of Savuti. 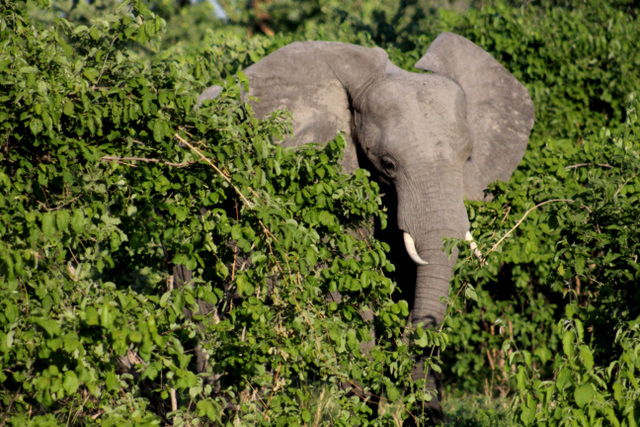 There are some areas where the bush is so lush (particularly during and shortly after the rainy season) where elephants are very quickly hidden out of sight. It is not uncommon to be driving along and suddenly greeted by an elephant right up against your window. 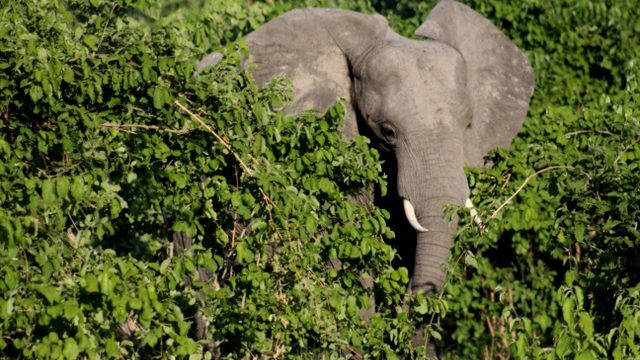 These large animals and surprisingly sneaky. A mom and her young walking back up the hill after a quick dip in the river to cool off. Their two-tone colouring showing evidence of how deep they went in. A family of elephants gather along the side of the river – drinking and splashing water over their backs to cool down in the hot Botswana heat. I’ve never seen an elephant lie down before. This guy gracefully flopped down amongst the bushes for a short break before stretching up again. Elephants have such character. They are the only wild animals that display personalities and moods. Sometimes cranky and irritable, other times cheeky and playful. 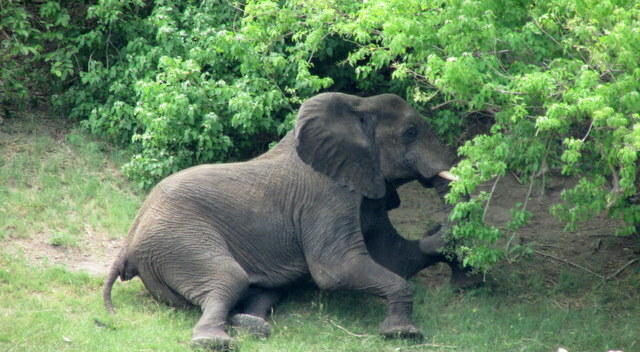 This elephant was just standing with her trunk resting on her one tusk, in an ‘I can do what I want’ way. I don’t agree with wild animals being in the circus at all, but had to have a laugh at this elephant, who was walking past our car stopped and decided to balance on three legs for a bit before carrying on. Just showing off really. 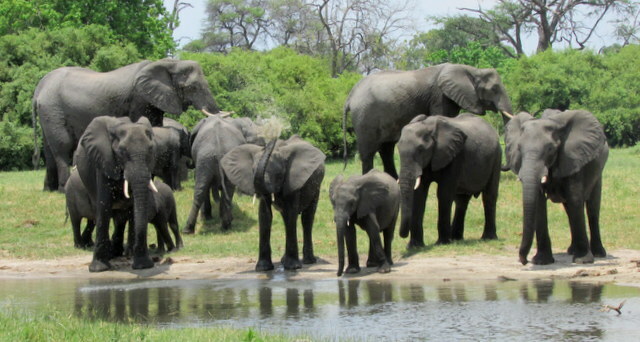 This herd, of over a hundred elephants, were having such fun cooling off in the river. We sat for about 45 minutes watching them as they all took turns going for a bath. I was amazed at how they went right under the water, leaving only the tip of their trunks above the water. Definitely the best place to be on a hot afternoon in Savuti. 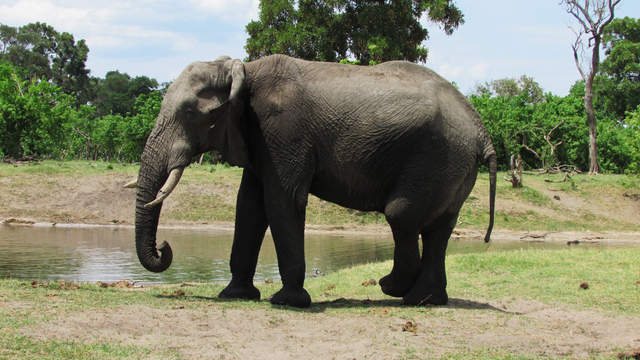 Elephants can drink up to 50 gallons of water a day. They fill their trunks up with water then pour it into their mouth, gulping down as much as they can. When elephants are on the move, they are single-minded. Nothing will get in their way, and there is no tree that can’t be pushed down. When they set off their mission, they often walk in a line with the young sheltered in middle alongside their mothers. The matriarch of the herd is normally holding up the rear. 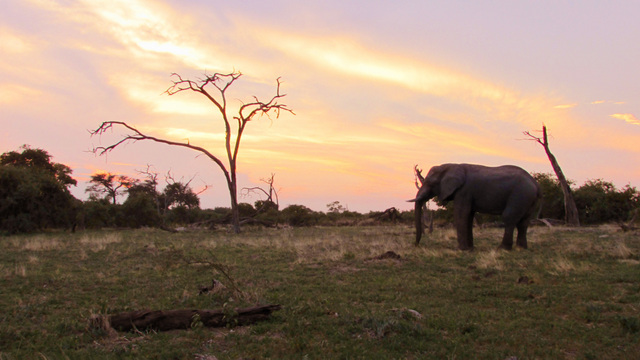 And to end it off, a beautiful elephant with the typical backdrop of an amazing African sunset. There truly is nothing better than an African sunset in the bush, with an elephant strolling past as you’re having a sundowner. Born with the longing to collect as many passport stamps possible and a passion for sharing interesting stories, it only seemed natural that Bridget delved into the world of travel writing. When she isn't dreaming of all the adventures still to be had and making plans to make them happen, Bridget is zooting around her home city - Joburg. Her tales of travels and life in the big city can be read at lifeherenthere.wordpress.com.